Plans are being made to fix the next 6 this year. 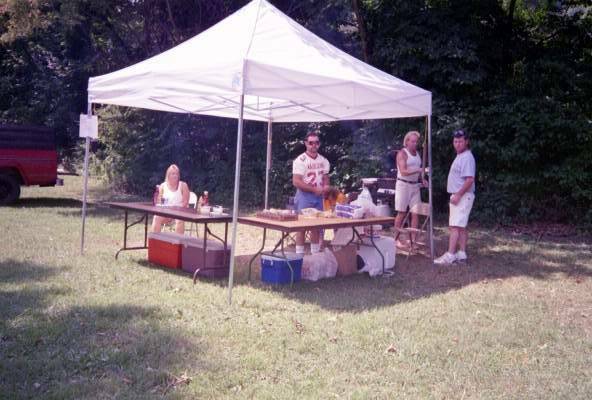 then type Grottoes to find all of our events. 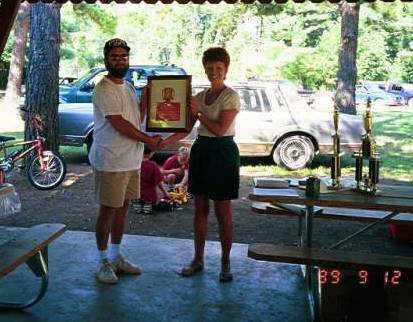 Rosette Cupp recieving the H C Eppard Incentive Award at our 1999 banguet. 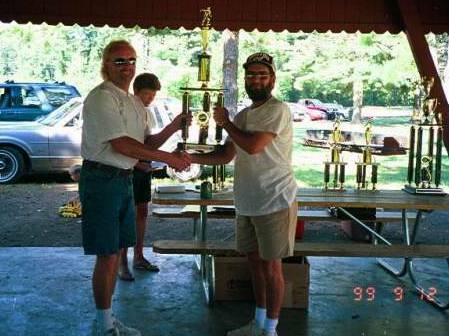 This award is given to someone who puts forth effort to promote the sport of horseshoe. 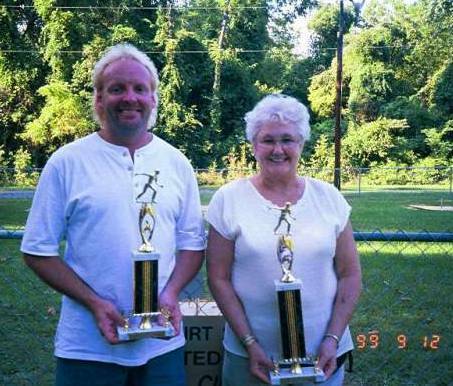 Hensel Eppard receiving "The King of the Hill" trophy from Betty Riley of Crozet. 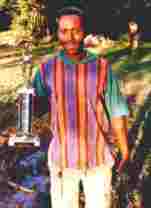 He founded this club in 1987 and has been active ever since. He recently retired, and is doing extensive travelling with his wife Pearl. Hensel is a lifetime member of the club. 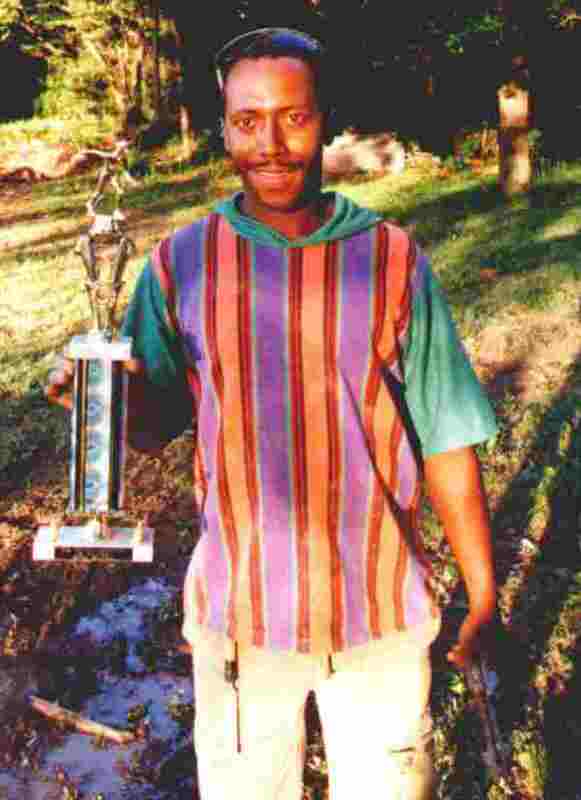 1987 - Steve Eppard, shown during the construction of our courts. 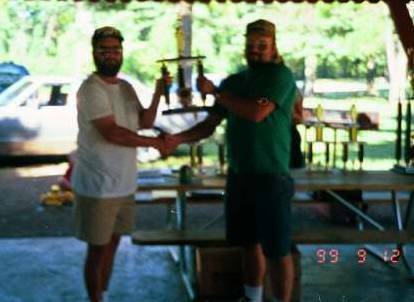 Steve has held various officer postions and was spokesperson for this club for ten years. 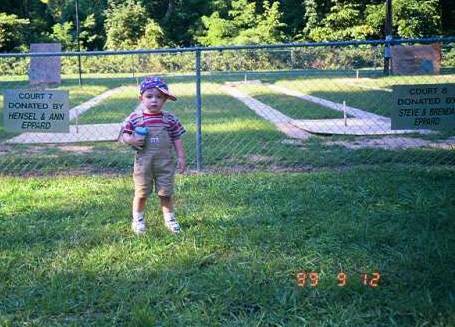 He resides in Waynesboro and is the son of Hensel. Earl Waggy receiving his award for being inducted as an Organizer into the Va Horseshoe Hall of Fame. Presenting the award is David Conley, 3rd Vice President of VaHPA. 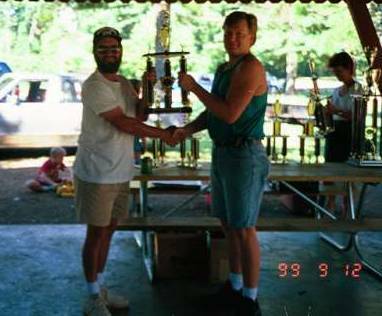 1998 League Champion, Kenny Lam (plaid shirt) accepting his award from Mike Cupp, League Director. 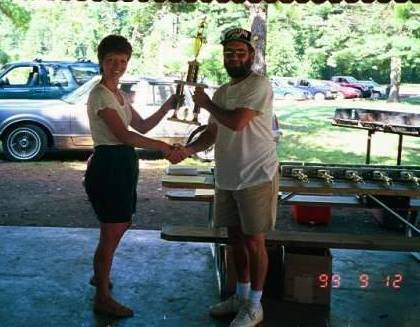 Audrey Swartz at the club banquet, accepting the 1998 H.C Eppard Incentive Award from Mike Cupp. She was also presented with a lifetime membership in our club at that time. 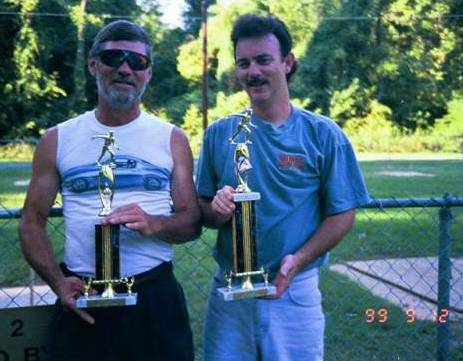 Steve Wheeler (left) and Darrell Brock displaying their trophies after a club tournament. 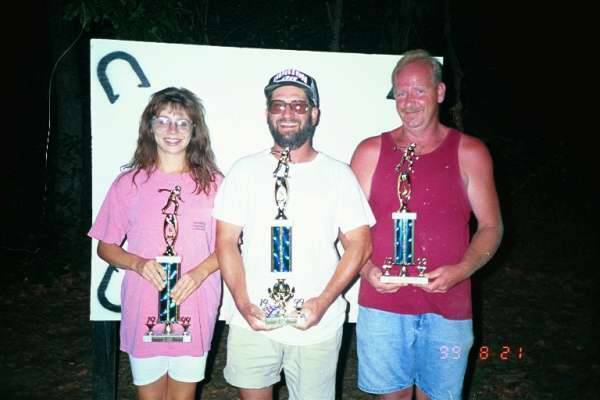 Tabitha Steger and Earl Waggy proudly showing their trophies after a pitch off for first place at the 1998 Old Dominion Summer Classic. 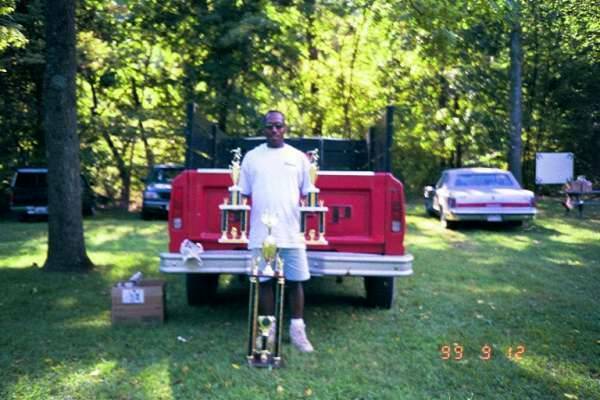 Julie Golden (left) and Candice Lawson with their first and second place trophies, 1998 Country Classic Tournament. Rosette Cupp with her "League Director's Director" placque at the 1998 banquet, for her hard work and dedication to the club, working behind the scenes to make the club run smoothly and efficiently. 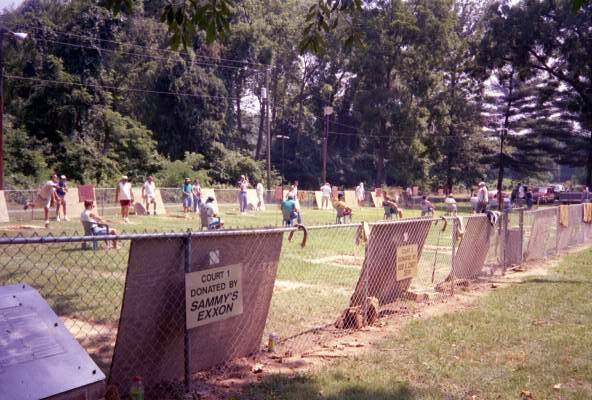 Shenandoah Valley Horseshoe Club, Grottoes, Va. Located in the west central part of Virginia, Shenandoah Valley From I-81 Exit 235 Rt. 256 east (southbound turn left, northbound turn right) about 7 miles Turn right Dogwood Ave. between ball field and convenience store follow signs to Grand Caverns Park, 1 mile Turn right into Grand Caverns Park, cross the river, 100 feet take a hard right towards pavilions Follow the road until it ends, you'll be in the parking area for the horseshoe pits. From I-64 Exit 96 Rt. 624 north (eastbound turn left, westbound turn right) 1 1/2 mile straight through traffic light you are now on Rt. 340 north, 12 miles Watch for signs to Grand Caverns Park, Left on 2nd St., cross railroad tracks, left on Aspen, follow to stop sign Straight across into entrance for Grand Caverns Park, cross the river, 100 feet take a hard right towards pavilions Follow the road until it ends, you'll be in the parking area for the horseshoe pits.